Jesus-Islam » His mission » If people are saved only by the death of Jesus, what about those who lived before He came? How were the people saved before the death of Jesus? Since the fall of man, the death of Christ has always been the only basis of salvation for mankind. Whether before or since the cross, no one will be saved without this major event in the history of the world. Jesus paid the price of the sins of all believers who lived before him as well as after him. The condition of salvation has always been faith. The object of this faith has always been God. The psalmist wrote: “Blessed are all who trust in him. (Psalm 2:12). Genesis 15: 6 tells us that Abraham believed in God and because he was not trusting his own righteousness, but the righteousness God would provide, He was declared right with God. (see also Romans 4: 3-8). The whole system of the Old Testament sacrifices was incapable of taking away sins. This fact is confirmed by Hebrews 10: 1-10. However, all those who lived before Jesus came, lived and died, directed their gaze forward to the coming of the Son of God, who would shed his blood for the sins of the human race. All the prophets asked their hearers to look to this final prophet-saviour who was to come. What has changed is not the object of the believer’s faith, but the clarity of it. God’s method of revealing His Saviour is like when we open a door into a dark room. The light shines into the room more and more as the door opens. God’s revelation is like that. It was a progressive revelation. So, Adam believed in the promise God made him in Genesis 3:15 where he was told that the ‘seed’ of the woman would overcome that of Satan. Adam believed in this promised Saviour, although he knew nothing more about who it would be. However, Genesis 3:20 shows that he believed because the Lord confirmed it by covering them with clothes of skin (verse 21). An animal was sacrificed and their nakedness and shame was covered. At that time, it was all that Adam knew, but still he had to believe, and he did. Abraham believed in the promises of God which granted him new revelations in Genesis 12 and 15. Before the arrival of the prophet Moses, the Scripture was not available. However, man was responsible for what God had already revealed to him. 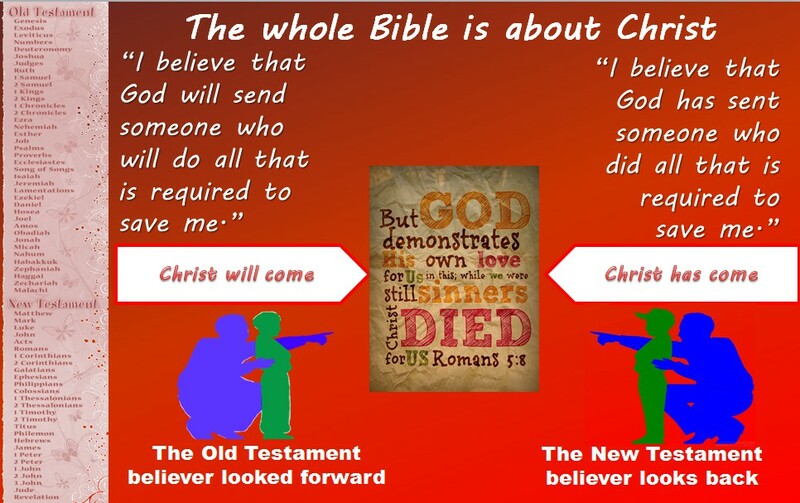 What was the difference between faith before Christ died and after Christ rose again? Throughout the Old Testament believers came to salvation by believing in what God had promised, knowing that one day he would solve the problem of their sin once and for all. They looked forward to the coming of this promised Saviour. Today, in our case, we look back, believing that the problem of our sins has already had its solution on the cross of Calvary (John 3:16; Hebrews 9:28). Our salvation is always based on the death of Christ, faith is always the condition of salvation and God always remains the object of our faith. For us today, the content of our faith is the fact that Christ died for our sins, buried and resurrected on the third day (1 Corinthians 15: 3-4). to the life, death and resurrection of the Promised Saviour, Jesus Christ.